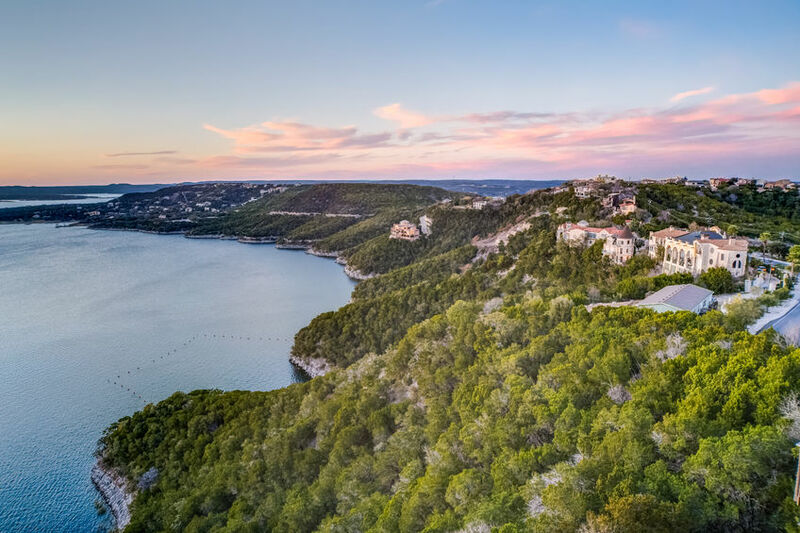 The Highland Lakes, formed by dams on the Colorado River, stretch through Austin and the Hill Country offering outdoor activity needs from lazy sunbathing to intense rowing or sailing. Lake Travis offers all sorts of water sports, such as windsurfing, boating, jet skiing, paddle boarding, or scuba diving. Lake Austin, which is kept at a constant level, is a boater’s dream. Town Lake provides serenity in the heart of the city with activities like boat tours and canoeing. Lake Travis is a sixty-five-mile long artificial lake on the Colorado River in southern Burnet and western Travis counties. In December of 1936, the United States Department of the Interior authorized the Lower Colorado River Authority to construct a low dam at the site of an old crossing on the river known as Marshall Ford. Marshall Ford Dam was completed in July of 1939. The present Mansfield Dam, a 7,098-foot-long concrete, earth, and rock fill structure that replaced the original dam was completed in May of 1942. Deliberate impoundment began in September of 1940. Lake Travis abounds with water recreation. It is truly a gem among Texas Lakes. With it’s crystal clear aquamarine water, Lake Travis naturally attracts water sport enthusiasts. From multi class sailboat and windsurfing regattas to competition ski boats, cruisers, cigarettes and mansion-like houseboats, Lake Travis maintains the marina facilities, public parks, boat ramp access and glorious hot summer weather make Lake Travis a go-to summer destination. Travis County leases 2,448 acres of land from the Lower Colorado River Authority for public parks around Lake Travis. Most parks have modest entry fees, with camping passes costing more. The following is a list of some of the county’s parks. You can call Travis County Parks at 512-320-7435 or visit http://parks.traviscountytx.gov for more information. Mansfield Dam Park is a popular spot and can get crowded if you’re trying to launch your boat here. The park isn’t ideal for swimming either, but it’s a nice spot for picnicking and hiking. and camping sites are available. The views of Lake Travis are excellent. Scuba divers love this park. Dive stairs, a wheelchair-accessible ramp, and a dive lift make this park convenient for divers, and also features a dive camping area. (Reservations must be made seven days in advance.) For lake diving, it’s a neat spot, with a sunken cage that provides a fish habitat. Four dive platforms have been added, and an underwater trail and compass will soon be laid out to connect underwater attractions such as sunken boats, historic dam construction materials, and geological points of interest. This park deserves its name – waters can get choppy and a gust of wind will steal your hat, but it’s a favorite for windsurfing and sailing. While there’s a boat dock, it’s restricted to sail craft only. Some swimmers venture here to take a dip off the sandy peninsula, as do scuba divers. Picnicking, sunbathing, and volleyball are options for the less water-inclined. A day-use park only, no camping is available and the park closes at 9pm. Pace Bend Park occupies for more than 1,300 acres; its size makes other parks pale in comparison. Pace Bend ranks as one of Austin’s favorite lake destinations. A bit of a drive from downtown Austin, this park makes the trip worthwhile with six miles of lakefront. Swimming, hiking, and cliff diving are popular here, but be careful when jumping from the rocks, because there have been accidents when water levels are low. Wave runners dart by, and you can lower your boat from the ramp, but call ahead for lake levels. Camping is possible and nice here, with over 400 places to pitch a tent, and several dozen RV sites. Camping reservations are recommended. Texas’ only spot for both voyeurs and exhibitionists, Hippie Hollow allows you to enjoy nature in your birthday suit, if you so choose. A popular spot, more than 350,000 visitors come each year. Not for the shy, be prepared for gawking by those on land and boat. If you’re brave, you get a line-free tan and will have a skinny dipping story to tell your friends. The views of Lake Travis from the steep, rocky shoreline are quite pretty, and the bird watching is supposed to be good as well. This private beach club on Lake Travis features a water park with slides and a pirate boat for the kids. Wave runner and ski boat rentals, chartered houseboats, as well as parasailing are offered. You can relax on the sandy beach that slopes down to the lake, watch the sunset, and grab a bite to eat at the Sundowner Grill. You can also rent a house for overnight stays or rent space in the marina for your boat. With over 10 miles of hike-and-bike trails, this 509 acre park includes ball fields, volleyball, rowing and canoeing. Other amenities include a swimming pool, picnic areas, and a playscape for the kids, and a boat ramp. The park is also home to the Stevie Ray Vaughn statue and Auditorium Shores. With 1,000 acres of land, this is the largest park in Austin, as well as Austin’s oldest city park. Boasting almost a mile of lakefront, it’s also a naturalist’s dream and ideal for hiking and biking with a 4.5 mile trail. Activities here include boating, skiing, fishing, picnicking, or sunning and swimming. The park includes two boat ramps, a fishing dock, a protected swimming area, restrooms, showers, sand volleyball, and limited camping. From the steep, rocky terrain of the greenbelt to numerous fitness trails throughout the city, Austin is the place for cycling enthusiasts. Home of seven time Tour de France winner Lance Armstrong, Austin’s moderate climate and diverse scenery make it the perfect place for both on and off road cyclists. Austin Adventure Company (512-209-6880) offers Austin and Hill Country bike tours and rentals. For off-roaders who prefer blazing their own trails, Bicycle Sport Shop (512-477-3472) rents mountain bikes.